We have plans to suit everyone, so take a look and see which of our great plans is right for you. Our plans are easy to understand, no fuss just great value. We think bill pay plans should be simple and offer you great value for your money. We have plans for everyone, so choose the one that suits you and see how much you can save with Tesco Mobile. *Access to 4G is strictly subject to a customer’s handset 4G capability, 4G network coverage and plan. Fair usage applies to unlimited tariffs - i.e. per 30 day period, up to 10,000 call minutes and 10,000 texts to landlines and mobile phones in the Republic of Ireland and 15GB of data used in the Republic of Ireland. Excludes roaming outside the EU, international, premium rate and other non geographic usage. Looking for a better value plan but still in love with your phone? We have the answer! Check out our great SIM only plans, we are sure we have just the one for you. 30 day SIM only plan is only available on a 30 day rolling contract. 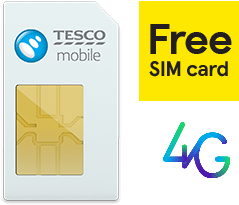 Tesco Mobile €25 Unlimited 12 month International SIM Only Plan is subject to a 12 month Minimum Term contract and a monthly charge of €25. You must be over 18 to avail of these plans. Payment by direct debit required. Plan includes 300 minutes per month to mobile and landlines in Poland, United Kingdom, Lithuania, Romania, USA, Germany, France, Italy, Spain, China and India which can be used when dialled from the Republic of Ireland only. * Fair usage applies to unlimited services – i.e. 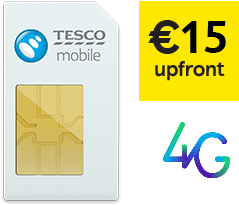 per month, up to 10,000 mins and 10,000 SMS can be used when roaming in the EU, plus 20GB of data to use at home and 9GB to use while roaming in the EU – see https://www.tescomobile.ie/billpayroam . Once you exceed the fair use limits, out of bundle rates apply. Excludes roaming outside of the EU, international calls, premium rate and other non-geographic usage. Access to 4G is strictly subject to a customer’s handset 4G capability, 4G network coverage and plan. See full set of terms. Offer ends 4th Sept 2019. Now you can customise your plan even further with our choice of add-ons. Choose from extra texts, more data and get exactly what you want from your mobile.